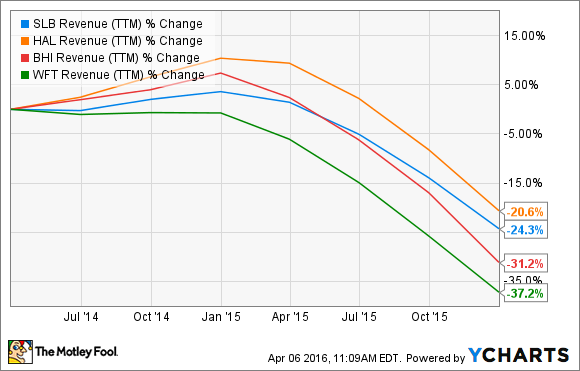 How Risky Is Schlumberger's Stock? While there is little risk of Schlumberger losing its industry-leading position in the oil-field services business, the company still carries some of the risks of operating in a commodity-driven industry. Image source: Schlumberger annual report. One of the hardest parts of sitting on the throne in a particular industry is staying ahead of one's peers while they vie for that coveted spot. For years, Schlumberger (NYSE:SLB) has remained on the throne in the oil-field services industry. Just because it has been there, though, doesn't mean the company's stock is completely devoid of risk. So let's take a look at how Schlumberger stacks up against its competitors and the overall market in which it operates to see how risky this stock really is. Let's run on the assumption that oil and gas will continue to play a pivotal role in supplying our energy needs for the next several years. Based on increasing demand for both around the world, it's a pretty safe assumption for a while at least. Another important thing to note is that to satisfy the need for oil over this period, it will take investment in new sources that require high levels of service activity. From 2005 to 2015, all of the incremental production gains came from three sources: deepwater, unconventional sources like shale, and oil sands. Unlike conventional oil reservoirs, these sources require a much higher amount of involvement from service companies to coerce oil and gas out of the ground. Image source: National Oilwell Varco investor presentation. Using this as our baseline, then Schlumberger continues to be the best investment in the oil services space. That also makes it the least risky. Unlike peers Halliburton (NYSE:HAL) and Baker Hughes (NYSE:BHI), which are pretty highly concentrated on the North American market and shale, Schlumberger's revenue stream is much more diversified internationally and has a much larger market share in deepwater. These positions and Schlumberger's history of good capital allocation have led to the company generating superior margins and more consistent returns on equity. 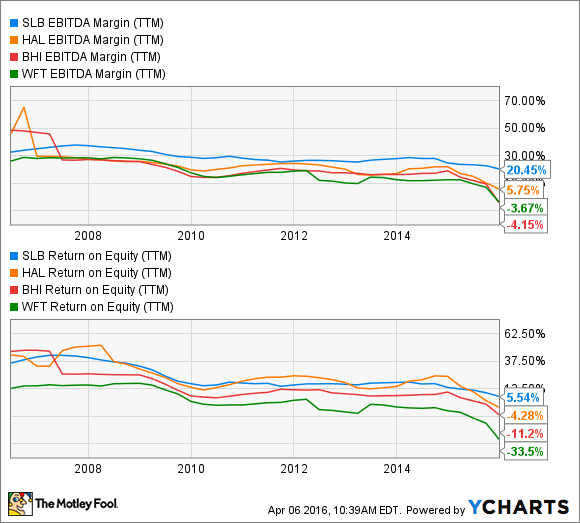 SLB EBITDA Margin (TTM) data by YCharts. When you also consider that the Halliburton and Baker Hughes merger is looking less likely by the day, it will keep Schlumberger well out ahead of its competitors in terms of size and scale. Another sign that the company will be able to maintain its lead in the space for years to come. As strong as Schlumberger's position may be in relation to its competition, the one thing that you always need to keep in mind is that oil services companies' prospects are always going to somewhat be in the hands of producers and their spending habits. With oil prices in the tank and so few producers able to generate operational cash flow, it's making it awfully hard to justify capital spending on anything raging to a couple million for a shale well to the tens of billions for an offshore multireservoir platform. Ever since oil and gas prices started to hit the skids, oil and gas producers around the world have either delayed or outright cancelled close to $400 billion in investments. This lack of investment has a double effect on the oil services industry: Delayed investments mean less work to bid upon, and the oversupply of oil and gas equipment held by oil services companies means there is an immense amount of pricing pressure. These have all led to large downturns on revenue across the sector. SLB Revenue (TTM) data by YCharts. The only way oil services companies can control the decline in revenue is to respond with similar cuts to their cost structures. So far during this downturn, Schlumberger has done a decent job of keeping its costs under control -- just look at the EBITDA margins above compared to its peers. To keep its costs under control, though, it has needed to make deep cuts to its workforce. These deep cuts could make it challenging for Schlumberger to ramp back up once drilling activity picks back up again. Among its large diversified peers in the oilfield services industry, Schlumberger has a pretty sizable advantage. This makes the company's stock a less risky investment and one that you feel much more confident over the long term. The biggest risk for the company is managing the undulating spending habits of its clients, which Schlumberger has done rather well over the decades it has been in this business. If you are looking to get exposure to the oil and gas industry with a lower amount of risk than many others in the space, then Schlumberger is a stock that is definitely worth a look.